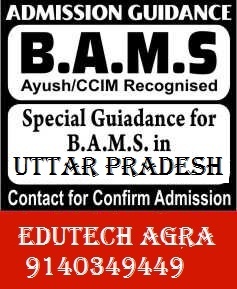 BAMS Admission : EduTech Agra providing BAMS admission in Uttar Pradesh & admission guidance services since 2009 in all over India. Successfully we have placed many students in best BAMS colleges across UP. We at EduTech Agra ensures that every students who takes our admission guidance should get admission in the best college of UP, india. we take care of each student at every stage of admission process and we have proved our quality guidance by providing admission in reputed colleges of UP as well as across the country.